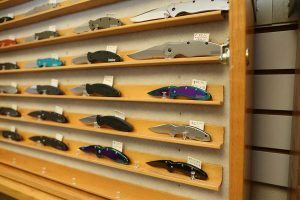 Edge-N-Knife is a specialty store for knives and sharpening tools in Eugene, Oregon. 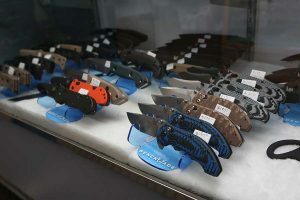 Our selection of more than 1,000 different knives comes from top brands including Benchmade, Kershaw, Buck, Spyderco, Messermeister and more. 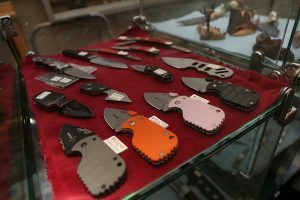 Our stock features every blade style from butcher knives, chef knives and tactical knives to multitools, pocket knives, machetes and butcher-block scissors. If we don’t already have it in stock, we can special order any knife from one of our many brand partners. Shop for our high-quality knives in our online store. 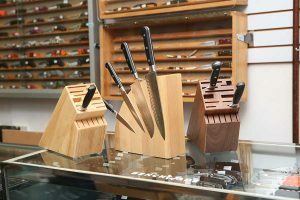 We are a complete cutlery store, offering kitchen knives for commercial use, restaurants and home. The Messermeister German forged cutlery knives we offer fit the needs of every chef with home, butcher and sushi knife styles. 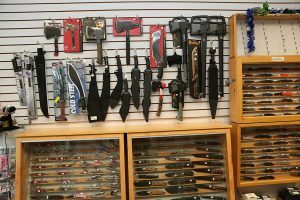 We also carry knife accessories including sheaths, knife blocks, drawer knife-holders, magnets, knife bags, basic knife-making kits and basic knife-repair tools. How do you shop for a quality knife? How do the properties of one knife’s blade steel compare to another in terms of edge retention, strength, corrosion resistance and toughness? Will you be using your knife in tactical applications, everyday use or as a tool for survival? Do you want a manual-opening knife, or do you want an automatic knife, commonly called a switch-blade? Do you prefer a liner lock, back lock, or axis lock feature? Our knowledgeable staff gathers the right information to guide you toward the best knife for your intended use. It’s also a great idea to feel the knife in-hand. The advantage of buying a knife at Edge-N-Knife is being able to feel a knife before you buy. The weight and grip of each knife is different, and those factors affect your comfort level when using the tool. We want you to feel good about your purchase, so visit us to check out your next knife in-person. Benchmade knives are manufactured in Oregon. Benchmade Knife Company takes pride in producing the highest quality precision manufactured product for their customers. Benchmade is dedicated to the end user, evidenced by their continued research for quality steel and materials to supply a durable product for use in a variety of applications. 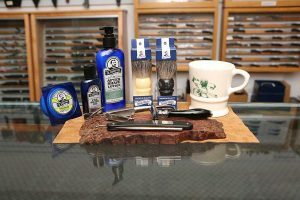 We have carried Benchmade knives since the company began, and we now stock more than 300 different Benchmade Knives and accessories. Benchmade has maintained a high standard for American-made products that have only increased in their quality. 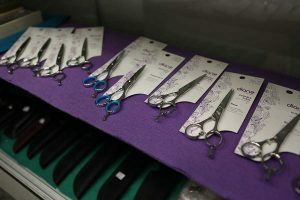 They produce automatic knives (switch blade) and OTF (out the front) or stiletto blades, as well as your basic opening knives. Benchmade uses state of the art steel and different handle materials to create knives that suit a variety of uses. Kershaw is a popular Oregon-based knife company and many of their knives are made in Oregon. Kershaw Knives offers assisted-opening features in many of their knife models, as well as diverse designs and features from handle color and material to blade design and steels. 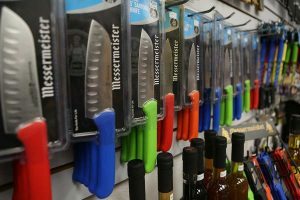 They offer knives at a wide range of prices to fit every budget. Kershaw also produces automatic knives. We stock almost every model of Kershaw’s durable pocket, hunting and fishing knives. Buck Knives was established in 1902 and since that time they have maintained a high-quality standard for knife-making. The majority of Buck knives are made in the U.S. They offer a wide variety of blade steels, designs and handle materials to suit your needs. Buck makes the knife our Grandpas used to carry in their pockets–the one, two or three-blade in the pocket knife. Their current line of knives entices both the old and the new knife enthusiast. Buck produces hunting knives, fishing knives, scissors, tactical blades and more. 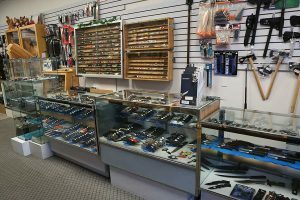 Cold Steel, Leatherman, Sog, Bear & Sons, Spyderco, Ka-Bar, Ontario, Outdoor Edge, Boker/Magnum and more.